The Connecticut State Grange Public Relations Committee offered 7 Contests in 2012. We would like to thank all of the Granges for participating in the contests and increasing their public awareness over this past year. Let’s see these numbers increase for 2013! Here’s the list of winners presented at the CT State Grange Session in October. 1.) “Spot On” - 60-Second Grange Video Commercial Contest - Granges were asked to submit a 60-second video promoting their Grange. 2.) 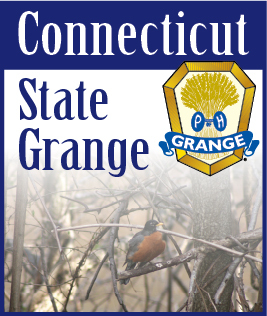 “Spreading the Word” - CT State Grange Website Participation Contest - Recognizes Granges who submitted information to be published on the CT State Grange website. Special Recognition Certificates were awarded to Meriden Grange No. 29 and Winchester Grange No. 74. 3.) “Show Us Your Stuff” - Grange Marketing Contest - Granges were asked to create a booklet highlighting the ways they promote themselves to the public. 4.) “Convey the Message” - Best Grange-written Press Release Contest - Entries were to be an ACTUAL press release written and used by each Grange. 1st Place: Winchester Grange No. 74. 6.) “In the News” - Best Newspaper Article Contest - Granges were asked to submit clippings of newspaper articles written about their Granges. With all of the wonderful articles written by newspapers about Connecticut Granges, it is sad that we only had four entries in this category. 7.) “Creating a Buzz” - Connecticut State Grange Social Media Participation Contest - This contest spotlights Granges efforts on Facebook and Twitter. 1st Place Winner: Winchester Grange No. 74.